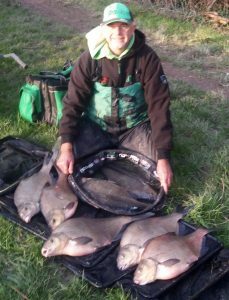 Club Secretary Ivan Currie fish the Kenn on Tuesday 8th January with a view to targeting the roach. He fished peg 8 standing in the mud and fished a 3AA waggler on 4lb line to 0.10 hook length and an 18 hook. Only had one roach but landed 7 bream the best going 8lb 10oz, all on single maggot and loose fed abut half a pint. Total weight approx 45lbs.